Customer Service, Do Not Waste Your Opportunities! According to Wikipedia, the obvious source for…well, everything, just ask my kids, there is a definition of Customer Service. Wikipedia of course needs sources, so they quote Jamier L. Scott: “Customer service is a series of activities designed to enhance the level of customer satisfaction – that is, the feeling that a product or service has met the customer expectation.” Not too bad, not totally complete either, but a worthy place to start. The important point here is that there is not mention of technology, no mention of product type, industry, nothing, nada, zilch! Since we are moving closer and closer to a totally service based economy, many many more parts of the organization are involved in Customer Service – not just those with ‘Service’ hidden within their title. You may sell a product, but whether you like it or not, you actually sell a service and give an experience! I was on a quick flight home on Friday, noonish, from NYC to Burlington, VT. The carrier was USAirways, the airport LaGuardia. The weather was not a factor, no mechanical, no last minute changes and the airport was quiet. Unfortunately, the person at the gate could not have looked more miserable, this was issue number one. Later, the gate agent needed to make an announcement, which of course was drowned out by another announcement, issue number two. Instead of one of them stopping and waiting (both USAirways announcements), they both kept going. Then, I went up to the agent and asked what he said, and he was perfectly annoyed (yes, my perception) at the fact that I was asking a question. He even said: “I just made that announcement”. I said, I understood, tried to make light of the fact that someone else was talking at the same time, yet he did not see the humor and gave me an answer, with attitude. I am not comment on the very strong accent, making his directions hard to understand – oops, I guess I just did (BTW – I do now hang my hat with Sword Ciboodle and a good Scottish accent can be quite thick :-). This was so very simple, yet it was a lost opportunity, no lines, no weather, no crowds, nothing. Too many employees, act like simple laborers and just do not seem to care. 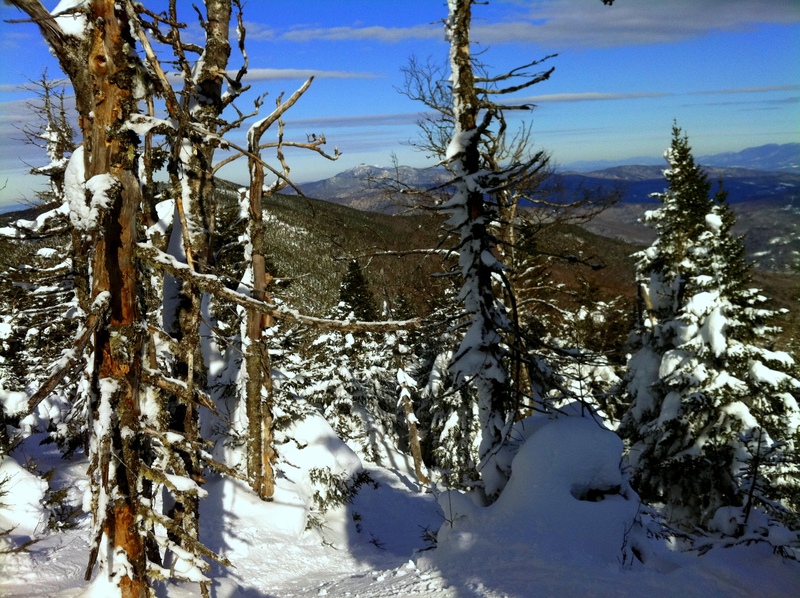 I went skiing on Saturday at Sugarbush Resort, just down the road from my home (45 minutes). The weather was great, new snow, and lots of people with the same idea! That said, we (middle son and I) put on our gear, hopped on the lift (lower lift was not much of an issue) and began the day. As we approached the lift, the person there greeted us with a genuine smile, and made a comment about the new snow, great weather and told us to have a great day. When we were at the upper lift, which had a bit of wait, the lift attendant was equally engaged. I could see his skis off to the side, but he was working that day. He had his sunglasses on upside down, and he asked how our runs had been and waited for the answer. He smiled and and wished us well. It just so happened we rode up with a volunteer ski patrol, same experience. Now, just to share, we spent a lot of time skiing in the woods, where there was a good 2-4 feet of powder and lot of trees (to avoid and use as brakes!). I do remember the skiing part of the day, more, but the overall experience does include the people. In flying, the experience begins the moment you pull into the airport, in skiing the experience begins when you pull up to the mountain (often in business you do not make your own reservation). My experience did not involve technology one bit (unless you consider the loud speaker). Beyond this experience, I would choose skiing over flying 9 out of 10 times, so it might not be a fair fight. Smiles are contagious and so easily to do! Twitter Lists, good or bad? I was lucky enough (or random enough) to be given access to a new Beta feature within Twitter called Lists. The Lists feature is similar to a compilation of features available by other means – create a list of interesting people to follow. For some details, and an interesting discussion, Robert Scoble shared some thoughts on Posterous. What is novel, is that Lists can be shared publicly. The public part can also be done by some other third party sites, like Tweepml.org – but the user still follows people at the individual person level. By creating and controlling Lists at the source, the equation has changed. Sharing publicly, also means that if I use your list, I relinquish some amount of control to you. There is a ripple effect to this subtle change in control. Suppose I get a little lazy and decide to follow a list for local tweeps (near Burlington, Vermont, where I live). Someone spends the time to make the list, and I do not want to repeat the effort. Did I just give up control? I will now follow the Burlington Tweeps that that person decides (they can add and remove people). Currently, I keep my own eye out for new folks, using a variety of hashtags – will I still add them to my list? Think about the impact to you and who you follow? Will Twitter be creating a pseudo class system? Lists make the utility of twitter much greater for the casual user who can identify a few highly curated lists and simply follow the list stream rather than the people. Once Tweetdeck, Seesmic and others integrate lists into their apps this could be done in columns in single streams. In this scenario it make sense that follower growth rates will decline. This may have broad implications for the twitter ecosystem. After all why should I curate a list of “Web Innovators” when Robert Scoble has done it for me! …it will limit the discovery of new people to follow and could result in two classes of twitter citizens – those who are on list that are followed and those are not. What are the implications of this change, for new users, and brands? I think that Brands will have a much tougher time, especially new entrants, as they will have a tougher time engaging. Andrew and I had an interesting interaction on Twitter based in this, which lead me to this post. The core problem is that for power users, who are creating the lists now (or when Twitter releases the function publicly) will represent a snapshot in time. Robert’s list of great programmers may grow, or possibly remain static. Hashtags offer a similar function, but they are not exclusive, they allow for new entrants. There are some interesting uses for lists as well. For conferences and events, the coordinator can create a list for people to follow. They could publish the List name far ahead of the conference and add potential twitters to the list. No hashtag to worry about, and up to 5 more characters to use. Brands and Companies will be able to share lists within an organization without everyone having to know who to follow. Marketing sends out a message “Hey, just follow http://twitter.com/mjayliebs/scrm&#8221; Big benefit to Social Service Communities. Follow Friday and follow counts may go away, or be reduced in importance. With lists, you may not have follow counts that have the same meaning. You may have a lot more people following you than you know (blocked people will still not be able to see your tweet stream). This will play itself out, for sure. But, the impact is bigger than it first appears. I know some of the people I interact with might not use lists, or might not use them extensively. Innovation and collaboration with NEW people will take a hit. New people will start with lists and might be less inclined to interact one on one. What are your thoughts? What are the impacts to transparency (you can add to list without a follow)?